If this is not something you have done before, it is quite straightforward and we can help! Here are some Q&A guidelines – please Contact Us for further information. How long does the display last? A display typically lasts about 7 minutes – this is about the optimum length of time for spectator and pilot alike! In an aeroplane such as an Extra, this is enough for a lot of aerobatics… Obviously the length of display slot will be adjusted to suit the programme, but usually will be between 4 and 10 minutes. It is a highly dynamic display – leaving you wondering “how can a plane do that?” The display sequence is designed to show off to the maximum the capabilities of aircraft and pilot, but always in a safe manner. The most spectacular manouevres are the flat spins and the tumbles. If the cloudbase is sufficient, we will include both upright and inverted flat spins, knife edge spins, tumbles going vertically up or down and off the top of a loop. At some points the plane will be flying backwards through its own smoke which is always spectacular. At other points it will be at or near its maximum speed of 220 knots (250 mph or 400 kmh). We will roll the aeroplane very quickly, very slowly, and demonstrate negative and positive flick rolls. The Extra is just as happy upside down as right way up – as well as inverted flight we fly outside loops – uncomfortable for the pilot but ‘no sweat’ for the plane! Using smoke it is also possible to draw shapes in the sky – hearts are popular especially at weddings! There are some limits – a display cannot be performed over a built up area. We’re looking for an open area – perhaps on the edge of a town or village or over parkland. There should be some separation between the display and spectators, and not display over buildings likely to have people or livestock in them. With a postcode we can take a look using Google Earth and advise on suitability. What happens in the case of poor weather? The Extra can climb vertically at least 2000 feet when it is given the chance, and so a full display requires a reasonable cloudbase on an average day. With a restricted cloudbase we tailor the display to suit the conditions and perform a ‘flatter’ display with rolls and flicks and knife edge passes for the photographers. There are legal weather minima laid down to cover displays, and if the weather is filthy the display would be postponed, or cancelled (at no cost – except for any CAA fees paid). There are three main cost elements – a CAA fee if applicable (see below), the costs of the display itself, and travelling to and from the venue. It is best to contact us for a quote for your event and location. At the time of writing, CAA fees in the UK are £189 (as applicable) and the main display and positioning expenses are the costs of fuel, plus smoke oil for the display. For a small event we are able to liaise with the CAA ourselves and pay any relevant fees on your behalf. Do we require permission from the CAA? Usually, yes. For a public display, Civil Aviation Authority permission must be obtained. For a private event such as a wedding, an exemption from the usual low flying regulations is likely to be required – at present the fee for this is £111. However in every case, if your event doesn’t involve other air displays which are also needing permissions, then we can arrange it all for you. If CAA permissions are necessary then 28 day advance notice is generally required. What are the safety, liability and insurance aspects? The Flying Display Director (FDD) is answerable to the CAA for ensuring safety. At a larger air display there will be an FDD appointed; at a small event the solo display pilot may also act as FDD and we have experience of this. The aircraft and pilot carry insurance cover including a high level of third party liability insurance to cover aerobatics at competitions and displays. If your event is open to the public it will also require some insurance cover. Every year we are examined for our display flying safety and competency and have been granted a Display Authorisation by the UK CAA. You must make sure that any pilot displaying at your event holds this qualification. As part of the usual application process for a display, the emergency services are also informed of the event and location. G-Force Aerobatics usually operates the Extra 300S but we can organise other display items for you, for example Flying Circus barnstorming, vintage and historic aeroplanes, warbirds and formation displays. Please contact us! How can I find out more about planning flying displays? The Civil Aviation Authority publish a document known as CAP 403 covering all aspects of display flying regulation and planning in the United Kingdom. It can be download from here. Please Contact Us if you have any questions. What exactly is G-Force anyway?! The high ‘g’ forces felt by pilots during aerobatics (or air combat) are caused by the balance of forces on the plane creating an acceleration (Newton’s Second Law). In a loop, for example, the lift generated by the wings can be many times greater than the weight of the plane, which creates a centripetal acceleration. The plane responds by following a curved path through the air. This is felt by the pilot as a so-called “g force”, forcing him into the seat and increasing his or her weight by the number of g’s of acceleration. 1g is the state that we live under due to the normal force of gravity, and hence our usual body weight. But during an aerobatic display, when I pull back hard on the control column, at high speeds the Extra can produce far more lift from its wings than its weight, and suddenly my body can weigh 8 times as much as it did a fraction of a second earlier – more than half a tonne. This puts great strain on your neck muscles (the head is very heavy) and also gives the heart a very great problem maintaining a flow of blood to the brain. Tensing the abdominal muscles can help to keep the blood in your head, but if you pull too many g for too long you risk “greying out” and then “blacking out” – known as GLOC (G-induced Loss of Consciousness). Conversely, pushing the stick hard forward induces negative g – here the blood rushes to your head, and your belt straps are the only things stopping you from being thrown outwards through the canopy. It is a generally unpleasant sensation and “too much negative” results in burst blood vessels in your eyes. 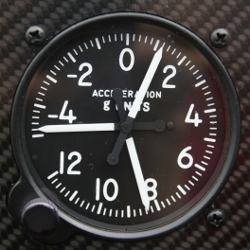 The g-meter in the cockpit records the minimum and maximum values felt, and after an aerobatic display it’s usually reading -5g and +8g. How on earth do you make a plane tumble like that? 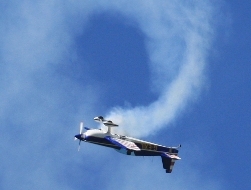 Some of the modern “freestyle” aerobatic manoeuvres look very unnatural – not to say impossible! Aerodynamic forces are only half of the story. With the modern, powerful unlimited aerobatic machines, when the plane is rotating fast at full throttle, very high gyroscopic forces are created as well. With the propeller rotating at high speed there is a gyroscopic precession – for example a pitch forwards can induce a strong yaw to the left. This can be strong enough to keep the plane flying completely sideways relative to its direction of travel, whilst tumbling end over end! Obviously this is not a very natural state for an aircraft to be in, and it takes a great deal of skill and practice to achieve repeatable results, with a safe recovery down to low level every time. What are the devices fitted to the Extra’s wing tips? These are called aerobatic sighting devices. In an upward vertical roll, for example, it is helpful to be able to look sideways towards the wingtip to see the horizon. When the wing sight is square to the horizon and exactly on it, you know that the plane is perfectly vertical. You display with smoke, how is it made and is it environmentally friendly? The Extra has a separate tank which is able to hold up to 35 litres of a special oil, and this is pumped at a rate of about 2 litres per minute into the lower part of the exhaust. The heat from the exhaust vaporises the oil into a white smoke. The mineral oil that we use now is akin to baby oil – it is very pure, safe and harmless. It is much cleaner and less smelly than the red diesel that was used years ago. The smoke disperses naturally and contains nothing presenting any risk to the environment. The Extra certainly consumes a goodly amount of fossil fuel, but tens of litres per display as opposed to big or fast jets burning thousands. When Chris is not flying displays for G-Force Aerobatics he is also involved in designing tidal turbines for green energy generation, so perhaps there is some mitigation there! I would like to try aerobatics: how do I start? If you would like to experience an aerobatic flight, please Contact Us, we can arrange it. If you have your PPL and would like some aerobatic training, there are several flying schools around the country specialising in this. Please contact us for recommendations. If you are serious about progressing in your aerobatics then join the British Aerobatic Association, which promotes and encourages aerobatic and competition flying in the UK and organises a series of competitions through the season from Beginner levels upwards.